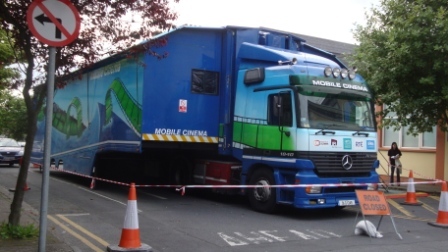 Despite Galway’s two multi-screen movie theaters (aka theatres) they brought in the Cinemobile for the Galway Film Fleadh (Fleadh = Festival). It may have been driven by economics, but it was certainly handy having it parked adjacent to the Town Hall Theatre as the movies were nearly nonstop starting at 10 am with the last one ending just past midnight (no, I did not see them all – my Lotto tickets haven’t paid off yet). I’d only seen the elusive traveling cinema in posters, so it was not only fascinating to see it in person, but to actually be able to get a first hand, inside view. With tip-outs on both sides, the Cinemobile seats about 100 patrons. It’s actually a great idea for rural communities who can’t afford to support a permanent theatre. 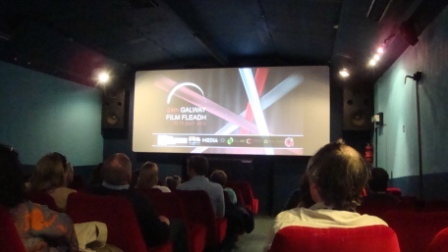 I saw two documentaries in the Cinemobile – Four Horsemen, a thought provoking look at what caused the banking crisis and other problems facing the global economy, primarily from a United States perspective; and Art of Conflict, which researched the cause and effect of the murals in Northern Ireland.